Order in bulk and save! Add 20 or more copies to your cart and the price drops to $8.44 each. The Book of Everyday Prayer is for anyone looking to have deeper conversations with God in a busy world. It contains a seven-day read-along guide for praying the hours—dawn, morning, midday, afternoon, evening, and midnight. Within each prayer you’ll find Scripture and even song lyrics to help you focus your mind and heart on God. Also included in the book are over 30 prayers for every occasion from cleaning your room to taking a test to fighting with a friend. There are even prayers for difficult times like parents’ divorcing or a loved one dying. For those wanting to dig even deeper still, there is also a quick guide to four ancient, mystical prayer practices that have been used by Christians for centuries—centering prayer, the Jesus Prayer, Lectio Divina, and the Ignatian Examen. 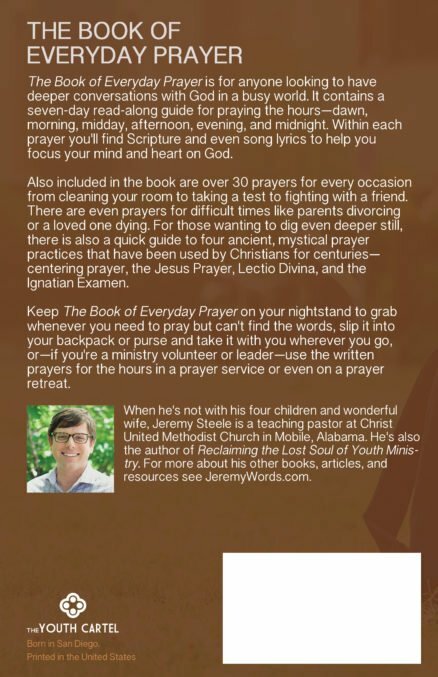 Keep The Book of Everyday Prayer on your nightstand to grab whenever you need to pray but can’t find the words, slip it into your backpack or purse and take it with you wherever you go, or—if you’re a ministry volunteer or leader—use the written prayers for the hours in a prayer service or even on a prayer retreat. When he is not with his four children and wonderful wife, Jeremy Steele is a teaching pastor at Christ United Methodist Church in Mobile, Alabama. He is passionate about reaching people with the message of Jesus in a way that engages them with the movement of God, and he speaks and writes in many forums across the US. He is the author of several books and resources, including Reclaiming the Lost Soul of Youth Ministry. You can find a list of his other books, articles, and resources at JeremyWords.com.